“The world of energy is very real. Its effect on all people, even those that cannot consciously perceive it, is also very real. As you consciously perceive subtle energy, you more skillfully manage how you are affected by the energy of the world around you, the energy of spirit, and how you use and project your energy in the world. There are those – such as you – who understand this and want to see, know and perceive these energetic realities. The Universe loves you and knows you do not want to be afraid to see the diverse and fascinating world of energy. To increase your ability to do this, you will need to grow your sensitivity. With sensitivity it is possible to sense, feel and perceive subtle energies as if they were just as real – if not even more so – than the denser physical forms of your world, like the table and chairs in your home, for example. The desire to do this, to open up to perceive these worlds, comes from an impulse within your spirit to know reality, to understand the truth of existence beyond the physical form. This is not something that has to be frightening. Perceiving and understanding the world of energy can be very interesting, empowering and exciting. Whatever the reason for your increased interest in the subtle worlds of energy, this oracle brings you a message. Even if you don’t really feel an urge to know the worlds of energy at a conscious level, your spirit does, and so the message of this oracle is brought to you too. There is a loving energy reaching for you now. If your sensitivity is already well developed, you will be able to feel it as a sense of love in your heart. If not, know that this higher energy loves you and is sending you a message. It wishes to confirm that it has been seeking to connect with you for some time. You might consider this energy to be part of your spiritual team of guides, or simply a loving consciousness that wishes to flow through your channels to empower your healing abilities or bless you in some other way with healing and love. By using the following healing process, you will be able to consciously call upon this loving consciousness, and invite it – and the joy, love and peace it will bring – into your life. Provided you use the process as written you shall only be inviting those beings that love you unconditionally and will therefore enhance and empower your divine destiny, not detract or derail it. 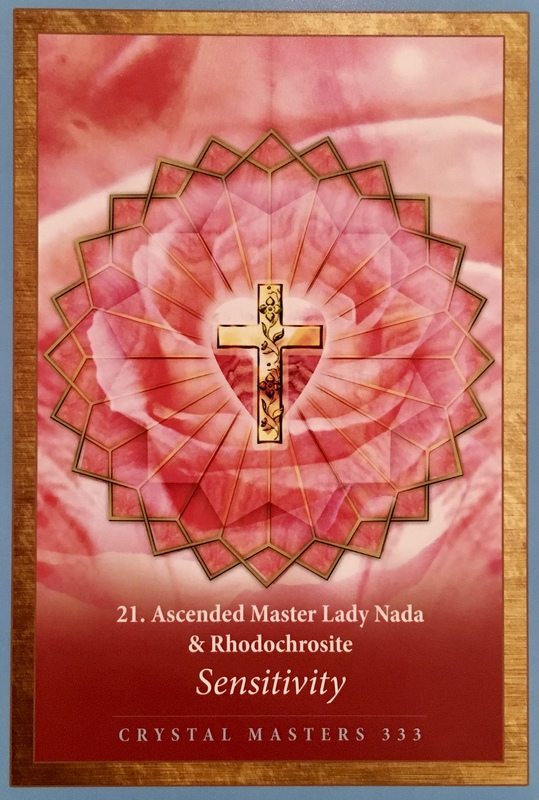 If you have been asking for confirmation of a message from a loved one that has crossed over – be it a person or an animal – then this oracle brings you that confirmation. This loved one is safe, held in divine love, and you can put your mind and heart to rest now. If you have been praying to your guidance and asking to know, hear, feel and see their messages more clearly, this oracle bring you the message that this has been heard by your guidance and is being answered in the affirmative now. You shall get your wish as your sensitivity increases. I am an empath as I am sure many of you can relate to. I can walk into a room and feel into it, knowing by feel how people are getting along, what’s going on, who’s happy, who’s sad and who’s hiding their true feelings. I don’t know the why’s of it all, I just get an inkling of what is going on. If I know people well, these abilities are amplified, and I can start taking on the feelings of others, both emotionally and physically. Like if you are devastated, and you come see me, we will both be crying. If you are bottling it all up and storing it in your body and it starts to cause you pain, I can feel that too. Sensitivity is a double-edged sword; it can be a great tool to use when you want to help others, particularly in healing modalities. But it can also, if you are not careful, be very draining and exhausting to take on the energies of others. I’m constantly working on my abilities, constantly working on opening up more, getting more information, getting more clarity. I would like to be able to see more, hear more, feel more, know more. But I also have to mix this with learning how to protect myself from denser, lower vibrational or dense energies and how to clear myself, releasing the energies that I do inadvertently pick up. I also have to be very clear on where the energies come from, and who’s they are. This allows me to separate myself from them, acknowledging them for what they are and then stepping out of that frequency. Then I can hold space for those who need to experience those particular emotions without them affecting me negatively. These are all learned skills and ones that I work on every day. There are still energies that I pick up without meaning to. There are energies that I experience that I think are mine that aren’t and it takes me a bit to sort it out. It’s a work in progress, just like everything else in life. We are being given the gift of extra sensitivity; embrace it. But be aware, be mindful. Learn to recognize the energies, learn to sense the emotions. Learn to trust your intuition, know that when things feel a certain way, even if they do not appear to be so on the outside, there is information there for you. Listen to your inner wisdom. Honour it.